We leave Sorrento for a 50 km drive through the towns forming the Sorrentine peninsula and continue on the State Road 145 “Sorrentina”, from where you can admire the scenery before reaching Salerno, the second city in Campania. After the visit of Salerno you continue by coach for about 60 km. 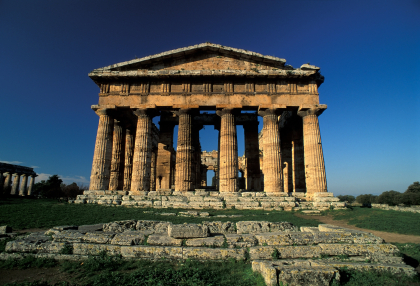 to discover the fascinating archaeological site of Paestum, where, after free time for lunch, you will visit the excavations characterized by the three remarkably well conserved Greek temples, known as the Basilica, the Temple of Poseidon and Athena. Your coach will take you back to Sorrento by late afternoon.